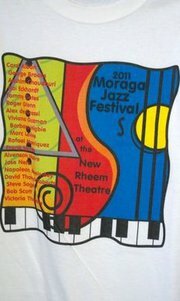 Moraga, CA (October 11th, 2011) – The countdown begins for the 2012 California Independent Film Festival (CAIFF), which will be held from Feb 10th, 2012 through Feb 16th, 2012. To usher it in, the organizers will have a series of events leading up to its opening night. The first event will be held this Wednesday, Oct 12th, 2012, 7 PM, at the Hacienda de las Flores in Moraga, CA. It is the launch of The Lamorinda Theatres Concert Series, with a special presentation of “The Autumn Benefit Concert for CAIFF”. This concert will be breathtaking as attendees will definitely be amazed at the eclectic musical scores, ranging from Jazz, New Age, Halloween to Fusion; especially, with the addition of exotic instruments –the largest crystal didjeridoo in the world, and singing bowls. On Friday, October 21st, 2011, it will be a day and evening of extravaganza. CAIFF is proud to present the theatrical release of its 2010 award winning film for Best Score, “Mighty Macs” at the New Rheem Theatre. This is a heart-warming true story of a small-unknown school’s improbable journey in 1972, to win the first national women’s collegiate basketball championship. Tickets are $10 for general admission; and $8 for matinee admission, students and seniors. In the evening, to celebrate Halloween, another fundraising event for CAIFF will take place. Lamorinda Theatres opens the doors to its “Dark Dreams Haunted House” at the New Rheem Theatre. This haunted house has been named one of the top-rated “Most Haunted Houses” in the nation and has attracted at least 500 visitors annually in the past five years. Ticket admission to the “Dark Dreams Haunted House” is $8; and $7 for the “Friday Night of Fright” movie. As a special treat, visitors purchasing both tickets will have the benefit of purchasing a small popcorn and small beverage for only $2. Tickets for “Mighty Macs”, “Dark Dreams Haunted House”, and “Friday Night of Fright” are available for purchase at the New Rheem Theatre Box Office or visit www.LamorindaTheatres.com . For enquiries, call 925.388.0752 or e-mail info@caiff.org . As part of the 2012 California Independent Film Festival Countdown, more future events are in-the-works , and they will be announced very soon in the festival’s website (www.CAIFF.org). Orinda, CA (September 27th, 2011) – The newly released, film, “Moneyball”, is currently one of the top box-office hits worldwide, and it is currently screening at one of Lamorinda Theatres’ cinemas—The Orinda Theatre. 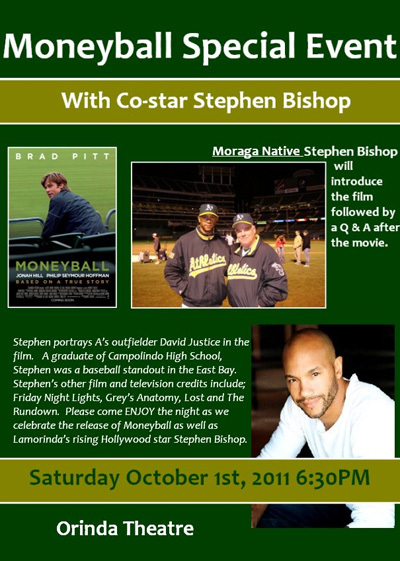 This Saturday only, Oct 1st, 2011, Orinda Theatre welcomes one of Lamorinda’s rising Hollywood Stars— Stephen Bishop, who will be in attendance at the 6:30 PM screening of “Moneyball”. Stephen hails from the town of Moraga, CA, and went to Campolindo High School. Mr. Bishop, who plays Oakland A’s outfielder, David Justice, in the movie, will be available to greet and meet well-wishers at the Orinda Theatre. He will also make a special appearance to introduce the movie, and to share insights and inside stories on the making of the movie, after its screening. Mr. Bishop’s other most notable film and television credits include Friday Night Lights, Grey’s Anatomy, Lost, and The Rundown. This screening is a special limited engagement in the Bay Area, and it is recommended that tickets are purchased before October 1st, 2011, in anticipation of being sold-out. 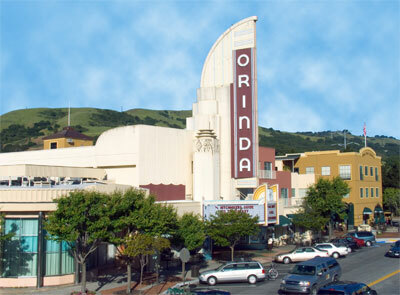 Ticket admissions are $10 for the general public, and $8 for seniors, students and children, and they are now available for purchase at the Orinda Theatre’s Box Office or at the theatre’s website (www.TheOrindaTheatre.com). For inquiries, call 925.254.9065 or e-mail info@LamorindaTheatres.com . The New Rheem Theater Celebrating One Year Anniversary! Come help the New Rheem Theater celebrate its 1 year anniverary! On June 25th, theywill be showing “Diary of a Wimpy Kid 2” at 3 PM, and Zachary Gordon, the star of the movie, will be in attendance as a special guest. It will be fun and exciting for all. There will have games for kids, cotton candy machine, and wheel of fortune for everyone to enjoy. There will also be having a reception at 6 PM and then a showing of the move “The Majestic,” at 7 PM, and the writer and associate producer, Michael Sloan will be on hand for a live Q&A after the movie. Tickets are $8 for the 3 PM show, and $25 for the 7 PM show (includes the reception). More information on their website at www.TheNewRheemTheatre.com.